My name is Lisa Coulburn and have been a professional Interior Designer since 1993 working on a variety of commercial and residential projects from London to Australia and a few countries in between. In 2004 I immigrated from chilly London to sunny Brisbane. 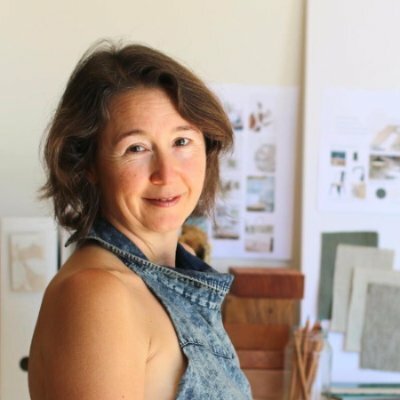 After years of working for interior design and architectural firms, in 2007, I started my own interior design business helping clients decorate, renovate or build natural and eclectic homes, shops, spas, cafes, bars and offices. Then in 2010 I started this blog to share ideas and inspirations and to reach other like-minded people with a passion for natural, healthier and greener interiors. After illness from mould exposure in 2013, I started studying again, part time, Building Biology so as to understand the science behind, the toxic hazards and chemicals that effect our health and indoor air quality, the risk of electromagnetic fields (EMFs) and radiation (EMR) to our health and the hazards of poorly constructed or water damaged homes. I believe that a home or any other indoor environment should be a natural, healthy environment and a place that reflects your lifestyle, personality and individuality. How you renovate or decorate can have a huge influence on the quality of the air within your indoor environment and how you feel when you are relaxing, entertaining or working. Materials such as paints, stains, varnishes, carpets, new furniture and kitchen joinery can off-gas VOCs, SVOCs and the likes of formaldehyde and benzene, producing poor air quality in your home. This can continue for years after the products and materials are initially installed. By selecting products that are non-toxic, organic and low or no VOCs you are improving the quality of your air within your home and reducing the effects of poor air quality on your health. Learn more about air quality & Volatile Organic Compounds (VOCs). This involves taking once loved furniture and waste materials and transforming them into new furniture or new uses. Why? This reduces the need for consuming new raw materials thus reducing energy use, landfill and lowering greenhouse gas emissions. By buying furniture and homewares made in Australia you are supporting local Australian communities, maintaining creative skills and local craftsmanship and reducing energy consumption and green house gas emissions by avoiding overseas transportation. If we do not buy Australian made products, demand will reduce, companies will just go out of business and the Australian made products will just not be available! Ethically sourced materials ensure that they are; a sustainable material; waterways are protected; wildlife habitat and species are protected; high conservation value forests are preserved; pesticides are rarely used; respecting workers and indigenous rights; and are economically viable. Fairtrade certified products provide better deals for farmers, producers and workers in developing countries. By buying Fairtrade products you are supporting farmers, their families and communities in receiving more stable and secure incomes, a fair price for their products, security of long-term contracts, environmental sustainable farming methods and improved working conditions. If you think that indoor mould growth is not harmful to your health, think again... Mould will grow in a indoor environment if there is excess moisture from condensation, a water leak, flooding and within air-conditioning systems. The main moulds that are found in indoors include Cladosporium, Penicillium, Alternaria, Aspergillus and Stachybotrys chartarum (known as black mould). Mould produces tiny spores that are not visible to the naked eye. These airborne spores and small mould fragments contain mycotoxins. Mycotoxins from these moulds are carcinogenic to humans and exposure to these cause mild to dangerous health conditions, for more information see Dr Shoemaker website and his leading research in mould related illness. Unfortunately, building standards and construction methods do not always protect us against excessive moisture levels and condensation in our buildings. With clever building design, the right choice of materials and by creating air flow we can reduce the risk of mould growth. Up until 2013 I was working full-time, fit, hiking, climbing, traveling and walking up 4000m high mountains in Borneo and Nepal! Early in 2013, I moved into a rental property and within a month I started to have asthma like symptoms. My health continued to decline, month by month, with many varied symptoms, including chronic fatigue, POTS, infection after infection, being bed ridden, not having the strength to cook a meal and my muscles were just wasting away. Something was very wrong? At the end of 2013 and after many blood tests, I tested positive for mould mycotoxins in my body, which was weird, as we could not see or smell mould in our home? Also how could mould do so much damage to your health? Within a week we had our our home tested by professionals. They found mould and bacteria happily growing under a bedroom carpet and hazardous levels of mould spores (invisible to the eye) floating in the air in this room and my home office below. This was all hidden from view under the carpet... The black and the white stuff is mould and bacteria growing on our chipboard floor boards. I dread to think what was also growing in the wall cavities, as this water leak came from the roof and would have travelled down through the walls. This was a rental property so we were unable to investigate further. Mould spore counts were extreme levels in this bedroom and the room below which was my office! We left that home that day never to return as the house was deemed unlivable. I was then diagnosed with a bio-toxin illness referred to as Chronic Inflammatory Response Syndrome (CIRS) along with Multiple Chemical Sensitivity (MCS) due the cocktail of moulds, bacteria and other nasties that grow in water damaged indoor environments. It has taken me a while to regain my health but this experience has lead me to further my studies of Building Biology and understanding the toxic hazards that occur in our homes, schools and workplaces in greater detail. Design breathable, non toxic and mould resistant homes. Thank you for your interest in Natural Modern Interiors. I look forward to hearing from you. I was reading your blog on tadelakt and seeing if you have much to do with natural lime finishes if so you could keep us in mind for future projects. We are a company based in Brisbane that applies all different types of imported lime finishes for exterior ,interior and bathrooms. Hi Lisa…Great About Me page….Im looking forward to exploring your blog and interior design ideas!! !